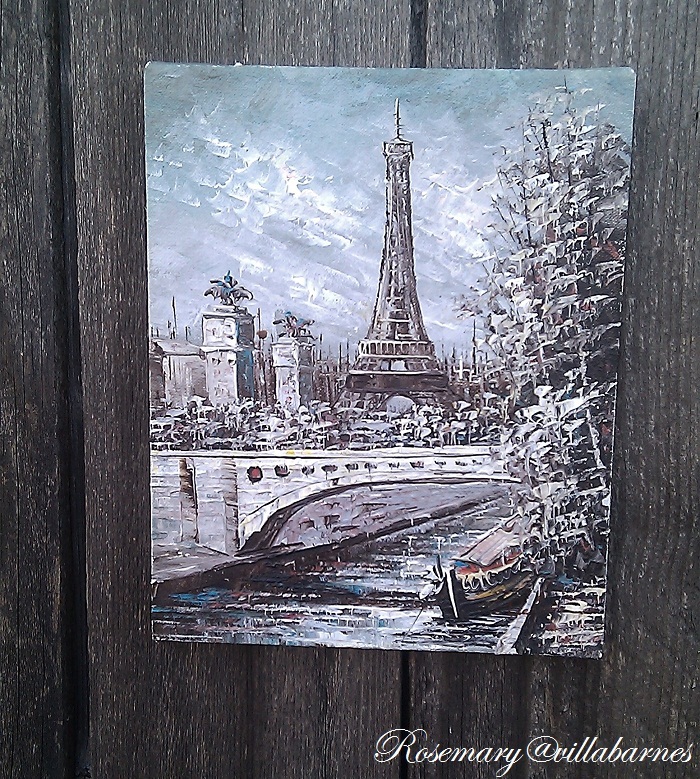 This Eiffel Tower painting has been in my stash for a good long time now. my husband came home with this. It was an Eiffel kinda day. The weather is pretty mild here today. However, this being Illinois and all. We may have SNOW later in the week. Seriously? Love your Eiffels Rosemary! It finally was warm here today...77 degrees! I am ready for it to STAY warm! Not 45 one day and 77 the next, LOL! LOL that is too funny! Where did he find it? ?Well they are both beautiful!Yes you are right I am sure it will snow.....again! 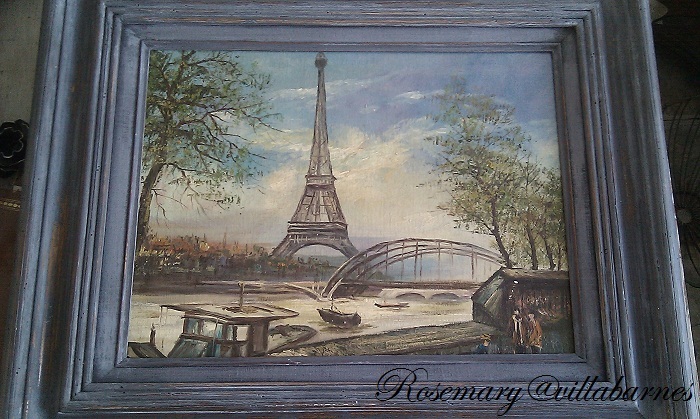 What great paintings, Rosemary! I love them both. I read the same thing for the Ohio forecast; 70's all week and then Friday, boom 48 possibility of snow showers. Enough already! Love the prints! 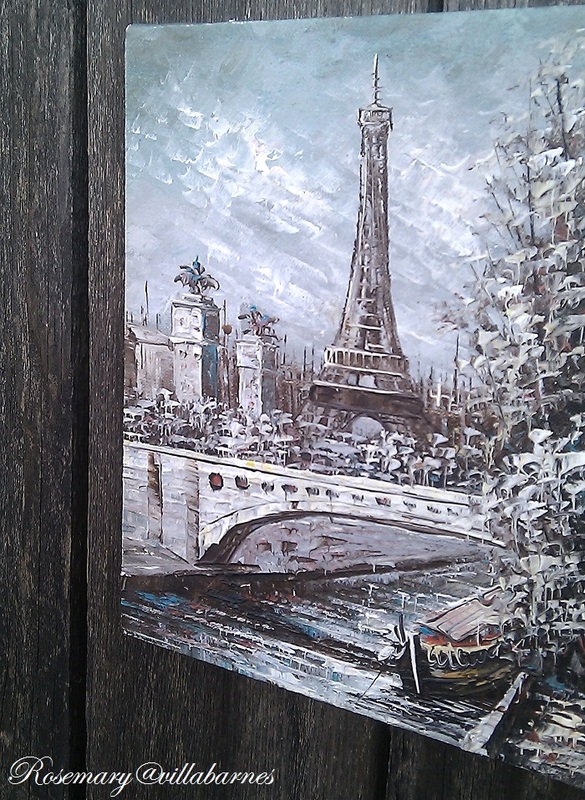 I recently purchased two french canvas prints. Love them! I too am ready for SPRING weather! I'm really loving that blue/grey colour you are using on the frames! Perfect for the Eiffel tower. Hailstorm here in Ontario tonight. They weren't big but there were plenty of them! Your husband sure does come home with a lot of goodies for you!!! 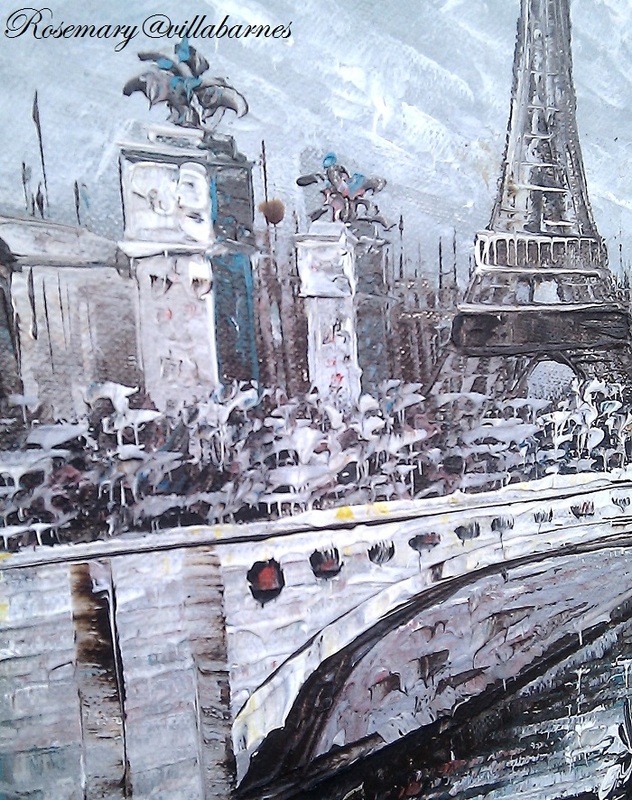 I love the paintings:) Booooo snow, go away! Oooh, la, la! Your Eiffel Tower painting are tres magnifique, Rosemary! I especially love the one that your hubby found. Good luck with Spring, we are fighting for it too. Hello Rosemary...just catching up with your posts, I've been really sick with pneumonia. I absolutely love these two Eiffel Tower pictures...how funny your husband brings one home as your revamping one from your stash!!! I'm going to try your wash technique soon...it's really cool. They are both beautiful! It is 80 here today and chilly and rain late in the week. Weird weather. One can never have too much French love in their life Rosemary... gorgeous paintings. 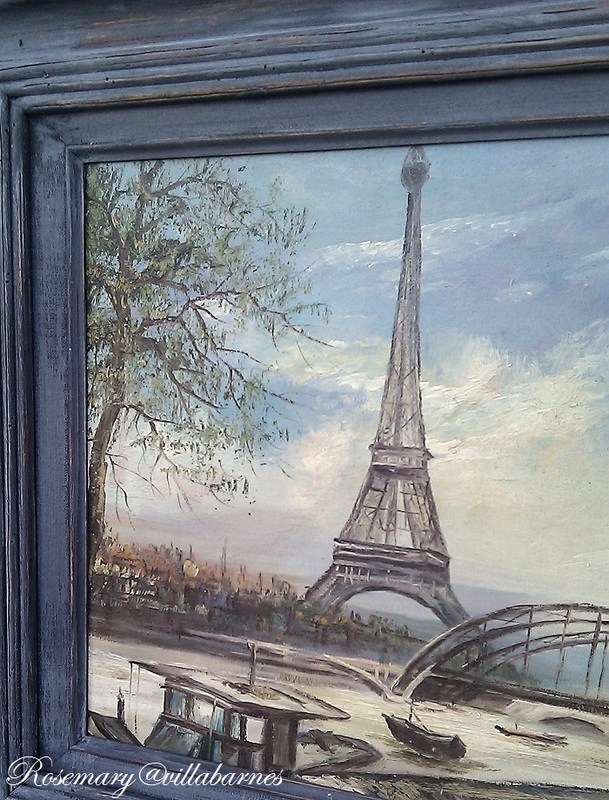 What pretty Eiffel Tower paintings and obviously your hubby knows just what you love!....it was 87 here today...it was cold last week! !...Crazy weather these days...hope you miss out on that snow!! Whoa - a sure sign you've been married long enough to really know each other well! 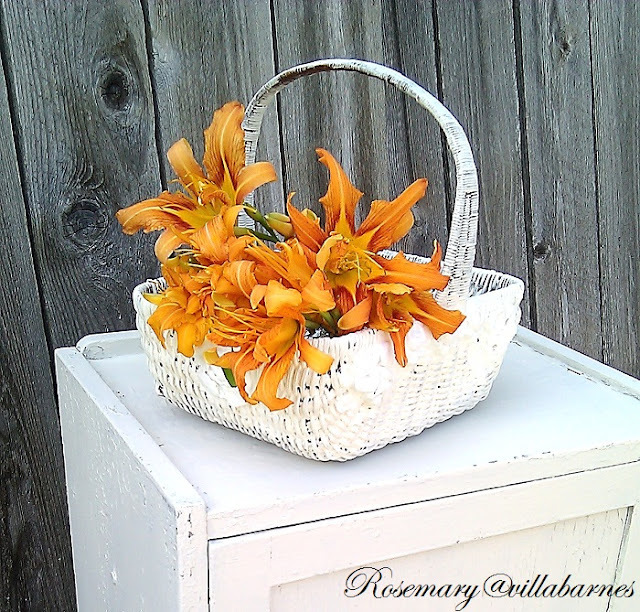 Spring is in the air -- yippee! Filled my bird feeder again -- they're hungry out there! Hi there! 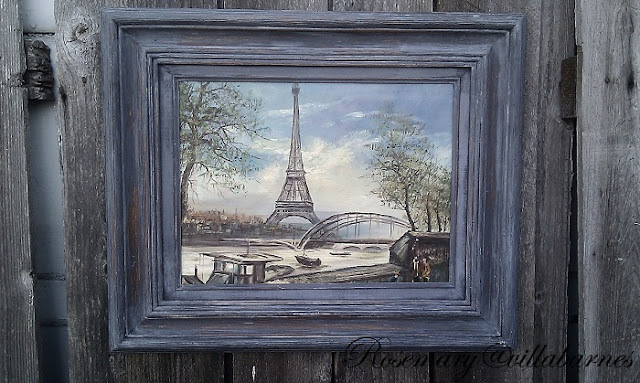 Just love your blog & these Eiffel tower prints! I live in SD but I am originally from Rockford, Ill. We are having very nasty, winter weather here & it is to continue tomorrow & possibly into Thurs. Usually our weather hits Ill a couple days later, but hopefully this will miss you guys! Love your work, you are sooo talented! What a happy surprise for you! I think I will paint my old doors like the one you have the paintings on! Yes, I see the unexpected in pictures! LOL What a great backdrop the doors will make!